The past weekend for Mother’s Day, my mom wanted a home cooked brunch with the entire family. Since we’re a hungry bunch and my mom did not care what kind of cuisine, we cooked a hodgepodge of dishes that satisfied our cravings. 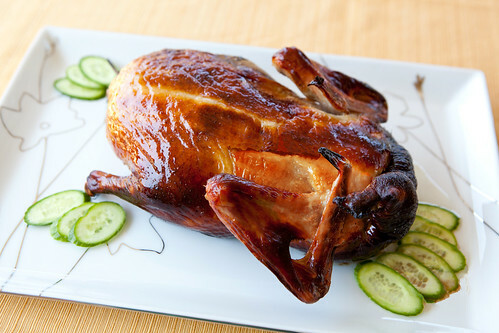 We roasted a whole Peking duck that was had a wonderfully burnished, crisp skin yet have tender and moist meat. 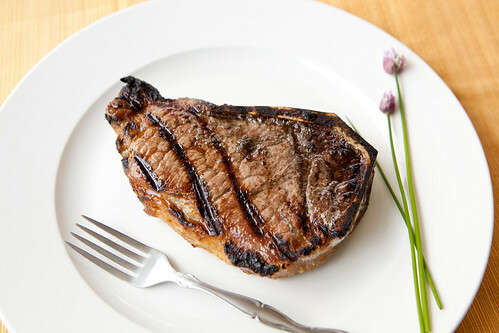 My dad grilled up Pat LaFrieda‘s New York strip steaks for all of us. And as usual, Pat’s steaks were sublime – effortless to slice and it’s beef heaven. 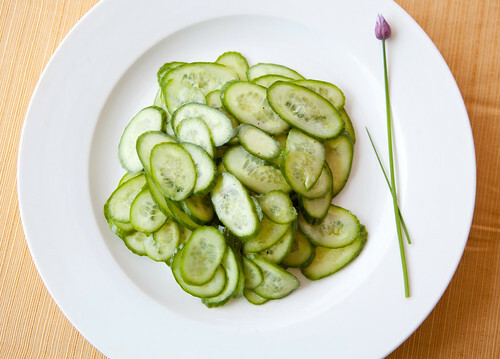 For a refreshing, and arguably the healthiest thing on the table, was the plate of quick pickled Japanese cucumbers. 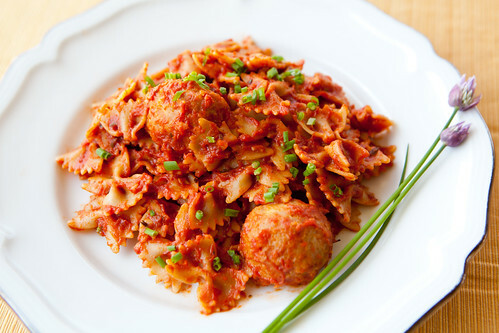 I used Garofalo pastas because they are considered one of the premier Italian pasta brands and even if you try a few bites of their just boiled pasta (cooked until al dente, it’s pretty flavorful and has a certain texture unlike most pastas found in the U.S.). 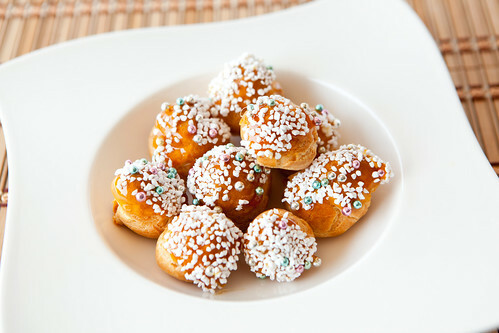 To end on a sweet note, we had homemade profiteroles filled with vanilla pastry cream and topped with caramel glaze, pearl sugar and pastel metallic dragées to make it pretty. 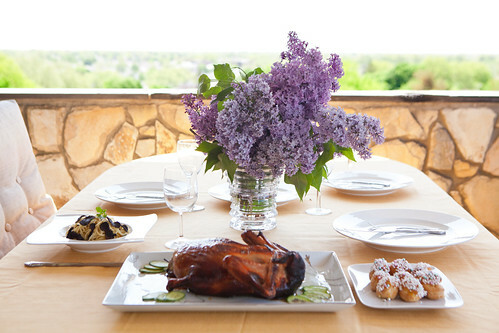 It was a gorgeous Mother’s Day to be dining outside, which I have the privilege of having a balcony and gaze into the distance while enjoying our food and company from my family. 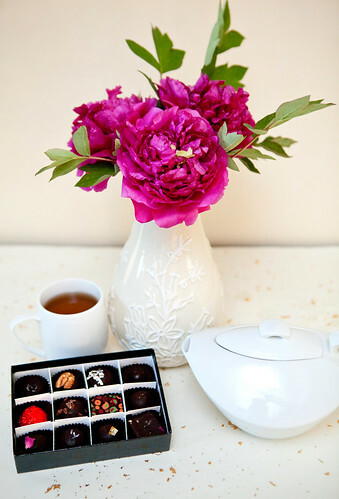 If the truffles are dirty, brush them with a paper towel. Slice them very thin with a truffle slicer or a sharp knife. 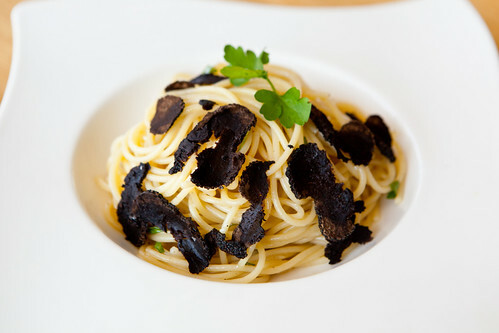 Place the truffles in a shallow dish and pour the olive oil over them. Cover them with plastic wrap, and allow them to remain at room temperature for several hours or overnight. Cook the spaghetti, following the package directions or the directions for freshly made pasta. While the spaghetti is cooking, heat 2 tablespoons of the oil in which the truffles are marinating in a large skillet, and cook the garlic until it is soft but not browned. Turn off the heat and add the remaining olive oil and the truffles. Drain the spaghetti, reserving 2 tablespoons of the cooking water. Add the spaghetti and the water to the skillet with the truffles. Reheat the mixture over very low heat just until it is hot. Stir in the salt. Transfer the mixture to a platter and serve immediately. Serve the cheese on the side. Mix the milk and bread pieces together in a large bowl. When bread has softened, mix in beaten egg. Add the chicken to bowl and mix lightly. Add remainder of ingredients and mix thoroughly. Form mixture into meatballs about 1½ inches in diameter and set aside (I used an ice cream scoop for ease). In a large nonstick skillet, add olive oil and sauté meatballs, removing them from the skillet as they brown. In the same nonstick skillet used for the meatballs, sauté the sliced onion in the remaining oil. When softened and lightly browned. Then add the tomato purée and chipotle flakes. Increase the heat and bring mixture to a boil, then reduce heat and simmer for five minutes. Return meatballs to the pan and continue simmering while you finish the pasta. Cook 3/4 pound of farfalle pasta according to the package directions al dente or approximately 8-9 minutes. Do not drain the pasta; using a slotted spoon, gently drain and immediately fold the pasta into the lightly simmering meatballs. Adjust sauce to taste with additional salt or pepper. Just prior to plating, sprinkle with the parsley or fresh chives.